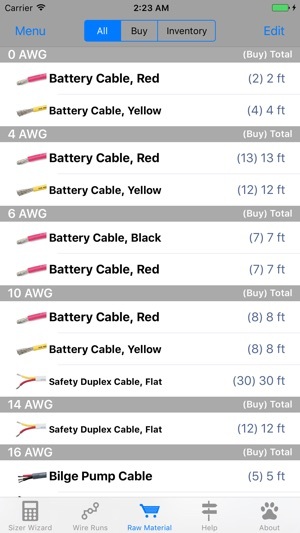 DC Wire Sizer is the most complete and comprehensive marine DC wire sizing tool in the App Store. Designed for both the marine professional (Sizer Pro) and the occasional user (Sizer Wizard, with just 4 easy questions). 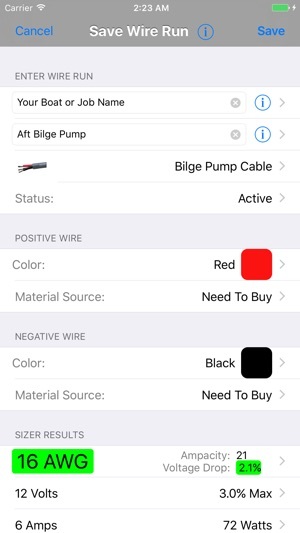 DC Wire Sizer is an indispensable app for anyone adding, upgrading or inspecting marine DC wiring. "The App is VERY user friendly -- almost scary good." "I think this is an incredible app. I wish I had access to it when I rewired my boat. As it is, I think I over-wired some things and under-wired others. 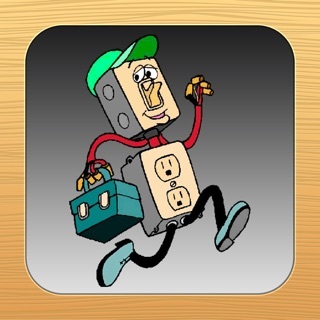 I still have some wiring to complete and having access to this app will greatly simplify my calculations." All too often boat wire is either oversized, costing you more money, or worse, the wire is undersized potentially causing damage to motors and electronics and wasting energy. There is also an increased risk of a failed survey or fire. The #1 cause of boat fires is DC shorts/wiring! Don’t let this happen to you. SIZER PRO -- is designed for marine professionals, tailored for speed with advanced options, such as 7 insulation ratings, 5 wire bundle sizes and maximum VD percent. For more granular analysis of VD and ampacity, tap the results and adjust the wire size or length. 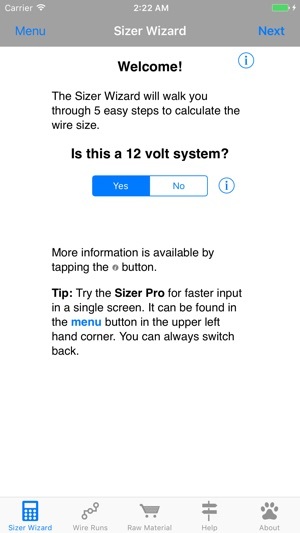 SIZER WIZARD -- is perfect for the occasional user, stepping effortlessly though 4 easy questions, before displaying the results. In each step, the user finds information, tips and help text instantly accessible. SAVED WIRE RUNS -- can be assigned a description within a Project (e.g. boat or job name); a wire type; wire colors; a status (Active, Completed, Cancelled), material sources (Use Inventory or Buy) and more. And you can edit, email or export the wire run from the Wire Run or Raw Material List. THE WIRE RUN LIST -- no need to write down all of the wire run information (e.g. wire size, length, wire type, color, name, and more). Saved wire runs can be viewed, marked or filtered (Active, Completed, Cancelled); or Re-order wire runs within, or between, projects in the Wire Run list. THE RAW MATERIAL LIST -- tired of making multiple trips to the marine store because you forgot to add in a wire run and can't remember whether it was 8 AWG or 10 AWG? DC Wire Sizer sums active wire runs for you by wire size (e.g. 8 AWG) and type (e.g. Safety Duplex, Primary, etc.). Mark or filter your wire by "Use Inventory" or "Buy”. 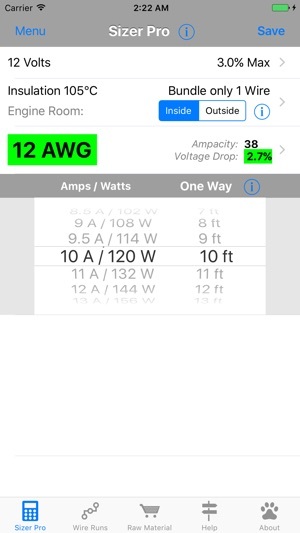 - Built-in Technical Notes has installation tips, wire colors, connector types, formulas (ABYC, ISO, Power Triangle, Ohm's Law, etc. ), recommended tools, and more. Dirty Dog Software, LLC, solar powered iOS software development. - Resolved issue accessing Settings on iPad (only iPads using version 1.1 were affected). - Added the ability to change the units of measure (aka feet or meters) on existing wire runs. - Added Solar PV Cable to the list of wire types. Awesome for pros and those of us with no experience! This app is easy to use and understand. The step by step instructions filled in any gaps for me. It's worth the money ten times over! 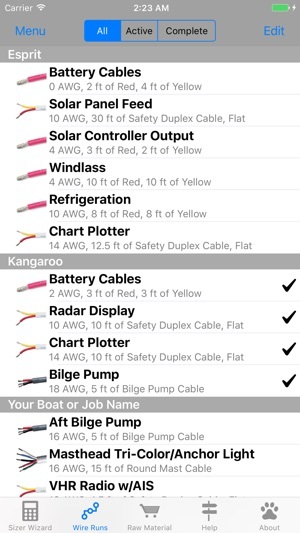 I know NOTHING about wiring a boat and yet, I was able to use this app to determine what I needed. Easy to use and very helpful.